Some of the Chef's Week PNW chefs: (FRONT, LEFT TO RIGHT: Sante and Common Crumb's Lynette Pflueger, Chef's Week PNW co-founder and Sante's Jeremy Hansen, The Blackbird's Molly Patrick and Inland Northwest Culinary Academy's Joshua Martin. BACK, LEFT TO RIGHT: Spokane Club's Mark Miskiewicz, Sante's Tyler Shales, Clover's Travis Dickinson, Sante's Joseph Choi and Chef's Week PNW co-founder Aaron Crumbaugh. Seated at a table, a server comes by to take your order. You wait. The dish comes out, maybe after drinks or an appetizer. Eat. Pay the bill and then leave, feeling sated until the evolutionary pangs of hunger signal again. Stripped down to the basic steps, it's easy to see how we can completely overlook where the food we consume comes from — the effort and people involved it takes to get, say, a burger from the field to the butcher to the restaurant to your plate and into your belly. Through a new event kicking off next week, award-winning Spokane chef Jeremy Hansen hopes to change those perceptions and encourage the average Spokanite to consider all angles of the food industry. Chef's Week PNW is a four-day educational showcase for culinarians of all levels, from frequent restaurant diners to casual cooks at home and anyone else simply curious about food. "So many people don't know where food comes from," Hansen emphasizes. At Chef's Week, he adds, "People can ask questions and see what we do on a daily basis, where we're getting stuff and how we're going about our business." During each day of Chef's Week, which runs from March 30 through April 2, events during the day — butchering and cooking demonstrations, Q&A sessions with local chefs and other industry experts — are all free and open to the public. Food trucks will set up for lunch each day in the parking lot of the event space, the newly renovated Washington Cracker Co. Building downtown. Guests can purchase $10 wristbands for wine, beer and spirits tastings featured daily during these daytime events, from 11 am to 3 pm. In the evening, ticketed multicourse dinners are collaboratively prepared by teams of four to five local and regional chefs recruited to participate by Hansen and the event's co-organizer, chef Aaron Crumbaugh. 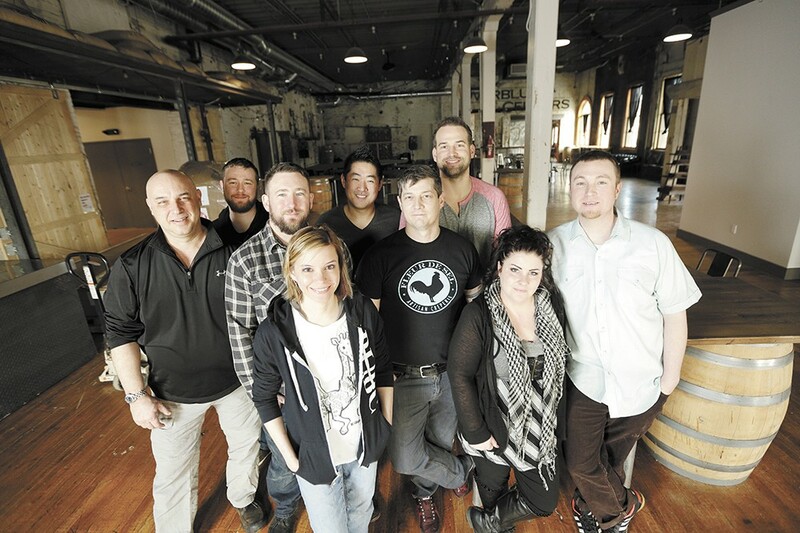 Together they've founded Tumbled Spruce Events, through which they're coordinating Chef's Week. Names on the featured chef list — nearly 20 in all, some from as far away as Montana and western Canada — include recognizable local industry leaders and innovators: Adam Hegsted, Pete Tobin, Tony Brown and Laurent Zirotti, to name a few. Others are young, up-and-coming faces in the local scene. This uniting of chefs with diverse culinary experiences is the second major focus of Chef's Week's twin goals of collaboration and education. "It's about coming together and building a food culture, and just building a camaraderie amongst local chefs," Hansen says. "The industry and the community thrives when we teach and learn from each other. Why not cook with other cooks and collaborate? That's what this world should be about, not just standing behind a stove and cooking the same thing every day." For each of the day's four dinners, groups of chefs are teaming up to create menus focused around the animal being broken down during the daytime demos: a Wagyu steer on Wednesday, Ahi tuna on Thursday and pigs on Friday. Separately, Saturday morning of Chef's Week offers an all-you-can eat brunch ($40), complete with omelet and crepe stations. The four-day event concludes with an eight- to 10-course dinner that highlights provisions made in the Inland Northwest: spices, salts, oils, vinegars, equipment and other goods. All 19 chefs will team up for the final meal. Hansen has been mulling the idea of an event like Chef's Week for years now, he notes, but it was only after attending Portland's annual culinary festival, Feast Portland, last fall that he decided to organize something similar in Spokane. "I was missing the food cultures that I'm used to in other cities and places that I've lived, and being engulfed in food and the culture of it. I missed working with fellow chefs and collaborating on dinners and doing these different things," he says. "Driving back from that event in Portland made me miss it even more." Here, Hansen owns Santé Restaurant & Charcuterie and Common Crumb Artisan Bakery. He's currently in the process of launching two new ventures later this year; Hogwash Whiskey Den and Inland Pacific Kitchen, both to be located in the Washington Cracker Co. building. Hansen and many of the Chef's Week participants have occasionally teamed up to host wine dinners and other special, one-off events, and he wants to keep that momentum going. But to succeed, diners also need to be excited and appreciative of the culinary experiences available in the Inland Northwest. When chef Aaron Crumbaugh first moved to Spokane three years ago, he asked a woman walking in the park where the best place to have dinner was. "I asked my wife, 'Where did you take me?'" Crumbaugh says. The chef had just left his Wagyu Wagon food truck and catering business behind in Chicago and moved to be closer to his wife's family in Chewelah. But Crumbaugh says that Spokane's food scene has greatly improved in the time he's been here, and meeting chef Jeremy Hansen has changed things for him. Together, Crumbaugh and Hansen are co-creators of Chef's Week PNW and its parent company, Tumbled Spruce Events. The two are also venturing together on the new restaurants at the Washington Cracker Co. Building. Crumbaugh recently quit his job with a Montana Wagyu farm, which kept him traveling constantly, away from Spokane, so he could spend more time with his family. He says that the Inland Northwest is where he wants to stay. The 37-year-old, who grew up in Michigan, has lived all around the country and at one time was a model and actor. He and his wife Hayden even did a stint on The Amazing Race. The chef thing took shape after Crumbaugh realized he was happier making food for friends and family than anything else, prompting him to enroll at the California School of Culinary Arts. "I'm looking forward to working with everyone," he says. "I want Chef's Week to bring unity among the restaurants and chefs in the industry." Chef's Week PNW is bolstered by chef Molly Patrick's Southern fusion culinary style. As executive chef of The Blackbird and Manito Tap House, Patrick sticks to her Georgia background and creates locally sourced, in-season dishes. For dinner at Chef's Week, Patrick will serve beef tongue pastrami, beef tataki and sweet corn cheesecake with a mincemeat and molasses crust, accompanied with Bailey's ice cream. Having arrived in the Inland Northwest in 2004, she has seen Spokane's culinary scene evolve, especially in terms of collaboration: "When I moved here, I was surprised that as a bigger city, we weren't very culinary-educated. There were lots of chain restaurants, but not as many family restaurants. But over the past five years, I've seen a lot of improvement." So when she heard about Chef's Week, she wanted in. "Our community is really small, so I heard about it, and I thought it would be really cool to be a part of it. So when I was offered to do it, I was stoked." Considering he doesn't even have a restaurant in the area yet, it might be some surprise that Chad White is already one of the most recognizable faces on the Inland Northwest culinary scene, mere months after moving back to his hometown of Spokane from San Diego. Much credit for that goes to his recent appearance on Top Chef, Bravo's popular cooking competition show. But it's also due to White's effort to meet and cook with seemingly every other chef in the area. He's collaborated at Santé, Ruins, Casper Fry, the Yards Bruncheon and Chaps, among others, in an effort to educate himself, impart some of his knowledge to the local food community, and foster communication among the area's culinary movers and shakers. Chef's Week PNW is a natural extension of White's desire for more collaboration among chefs by cooking together, and educating the public together about quality, healthful dining. "Educating diners and guests on where food comes from, being sustainable and sourcing locally, is really important," White says. White is trained in classic French and Mediterranean cuisine, and became known in San Diego for unceasing creativity and, after falling in love with Mexican flavors, for his Baja-influenced cuisine, particularly seafood. He still owns two restaurants, San Diego's Craft Pizza Company and La Justina in Tijuana, and has plans to open at least one in Spokane — the first, rumor has it, a ceviche spot — in the coming months.